Last Saturday we travelled to Fermoy to play our first hurling game of the year. The Fermoy team had some very strong players and we were under pressure from early on. The game was played over 3*15 minute periods. By the end of the 2nd period Fermoy were well in front. However our boys never gave up and as the game went on we were improving all the time. It was a tough match for our first league game of the year, but it was great to see so many players for our first game. We had a record number of players turn up on the day, 16 in total. It was a bit hectic at times on the side line getting all of them on and off the pitch, but despite the defeat they all got great enjoyment from playing the game. The players on the day were Torin O'Brien, Richard Barry, Kevin Barry, Luke Morrison, Jack Burke, Cathal Sheehan, Ewan Long, Rory Condon, Dylan Leech, Jack Reals, Shane Hussey, Adam Lardner, Sean Og Maguire, Oisin Cronin, Lee Ryan, Peter Verling. Next Saturday we are back to football again and we are playing away to St Nicholas. Last Friday we played Ballycastle at home. This was ½ Football and ½ Hurling. Ballycastle had a large panel and have some excellent players which made for two good games. We welcome Lee Gaels next Monday 3rd to Castlelyons in our hurling league, this will be a huge test, but hopefully one we will be ready for. Training has been going well and we will train twice weekly with matches almost every weekend from now on. We are back this week with a lotto jackpot of €9,800 and the €2 tickets can be purchased in Murphy’s Vehicle Repairs, Sharon’s Hair Design, Community Centre Bar, Fitzgerald Butchers Fermoy, Mc Donnell’s Coolagown, The Abbey Tavern and from the usual ticket sellers and promoters. Astroturf Training incurs a fee of €2 per child, to cover the cost of the pitch rental. Please note that all hurley’s with a band, must have the band covered with insulation tape for these training sessions. Training continues this Saturday in the Astro Turf in Brides Bridge from 9.15-10.00am. Training continues this Saturday in the GAA Main Pitch in from 10.00-11.00am. 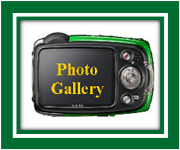 Football Match against Fermoy at home this Saturday, April 1st. Time to be confirmed. Training begins twice weekly starting on Wednesday nights in the Fr Ferris Pitch from 7.00-8.00 from Wednesday March 29th. Football Match V St Nicholas away Saturday April 1st. Time to be confirmed. U12 Hurling match V Lee Gaels at 7pm on the Main Pitch on Monday April 3rd. Training continues twice weekly, Wednesday night in Leahy’s Field from 7.30-8.30pm and Sunday mornings. U16 training continues on Monday from 8.00-9.00 in Leahy’s Field. Training continues on the main pitch on Wednesday nights from 8.00-9.00pm. 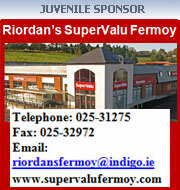 We would like to sincerely thank Riordan’s Supervalu for their ongoing sponsorship of the Juvenile Club. With some fantastic in store offers, it would be worth your while popping in for a look.